Over the past month or so, with my posts about the truth about evolution, it might appear that I've built up a certain good will with a lot of anticreationists out there. OK, maybe "good will" is a bit strong. Whatever it is, I'm about to squander it. I am a creationist after all. The truth about creationism is that it's not stupid, illogical, or irrational. Creationism is not based on "blind" faith (whatever that is). Creationism is not a modern theological abnormality, nor is it an outmoded pseudoscience. Creationism is not a threat to science or to science education or to human rights. This book has an unintentionally accurate title, since the version of Darwin's life presented in this book is mostly mythological. The Darwin Myth was written by Benjamin Wiker, who holds senior fellowships with the St. Paul Center for Biblical Theology and the Discovery Institute, according to the book jacket. Of course, the book jacket's accuracy is open to question. It also raves that the book "casts aside Darwinism's politically correct veneer and offers a critical, scientific analysis of Darwin's life and his history-changing theory." Scientific? Not even close. I finally watched The Voyage That Shook the World, the new Darwin documentary from Creation Ministries International. From the accounts I've read, it cost CMI more than $500,000 to make, and it definitely shows. It's quite a lovely film, and the re-enactments are fairly decent. CMI's strategy of setting up a production company called Fathom Media to covertly arrange the filming of historical sites and interviews generated some controversy, which of course they dispute. You can find a positive review by Ted Baehr at Movieguide (no surprise there) and a critical review from Jim Lippard here (also no surprise). To be fair, Lippard's review is pretty balanced and not overly fanatic, unlike Baehr's. With all the hubbub about the 150th anniversary of Origin, it's easy to forget that Darwin was more than just the father of modern evolutionary theory. He originally established his reputation with his geological research on the Beagle voyage. That was followed by the first extensive study of barnacles, published in four volumes (1851-1854). After that came Origin, which was followed by a book on orchid pollination. Darwin revised Origin five times and wrote related works on variation in domesticated animals and plants, the descent of man, and the expression of emotions in humans and animals. He produced other books, too, on such diverse topics as carnivorous plants and the action of worms. I suppose it would be presumptuous of me to review Darwin's Origin of Species, but it seems fitting to kick off Darwin week by looking at a new edition of Origin. This year, Harvard University Press released The Annotated Origin, a facsimile of the first edition with new notes by James Costa. Costa is a professor at Western Carolina University and director of the Highlands Biological Station in North Carolina. 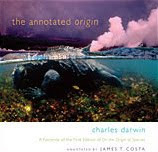 According to Frederick Gregory's review in BioScience, the book is the result of Costa's course on Origin, which he has taught now for a decade (Gregory also highly praises Costa's work). Exactly 150 years ago this week, Charles Darwin's Origin of Species began to change the world. In honor of that anniversary, I'm going to review five Darwin-related "products" (books, movies, etc.) this week, one each day. I'll kick off the series tomorrow with my review of The Annotated Origin, published by Belknap with annotations by James Costa. That will be followed on subsequent days by my comments on the complete works of Darwin (published by NYU Press), CMI's new movie The Voyage that Shook the World, Wiker's book The Darwin Myth, and Frederick Gregory's The Darwinian Revolution, an audio course from The Teaching Company. I see the maize genome is out today. That's pretty big news (in my little world, anyway), so I want to take my time before I comment. You'll find the articles at Science and at PLoS Genetics. I've got a lot of reading to do. In other news, PNAS has a really nifty article by Bunce et al. on ancient DNA of New Zealand moas. Moas are those giant flightless birds that went extinct about 600 years ago. The (nonauthoritative) NCBI taxonomy database lists 14 different species in two families. Bunce et al. sampled 263(!) different moa specimens to reconstruct both the species phylogeny as well as a new view of the paleogeography of these species. They argue that the main morphological radiation of moas took place on the South Island. Definitely worth reading. There's an interesting piece in the latest Genome Technology (of all things) on the flaws of the peer review system. Peer review is the process whereby the proposals or papers of one scientists are privately examined by other scientists for technical quality and importance. One common theme in the GT article is the problem of volume: there are too many papers to review and edit, too many grant proposals for too little money, and not enough scientists who can take time to do a quality review. Fortunately, this is not the case with creationism. Those who know me know that I'm pretty fanatical about peer review. I'm a tough editor and reviewer, and I make no apologies for that. I've even co-authored a paper on peer review. I don't want to rehash that entire article, but for those who don't want to read through the whole thing, here are a few thoughts. This is not a book review, because I haven't even finished the book yet, but I think this book is important enough that I wanted to share some preliminary impressions. For a hundred and fifty years, antievolutionists and creationists have complained that evolution is not merely a scientific theory but that it brings consequences that are dangerous to individuals and to society as a whole. You know the kind of thing I'm talking about. "Evolution is an atheistic ideology." "Evolution teaches us we're no better than animals." And on and on. As a creationist, I've said similar things myself. But in every generation, we've said these things based on our own impressions or on anecdotes. In recent years, I've become a little skeptical of this line of thought, mostly because I've never seen any specific evidence for it (other than anecdotes). 1. It's a common enough argument, and I'm too lazy to look up specific references. 2. I don't want to name specific names because I'm not looking to pick a fight. People are way too sensitive about this sort of thing. We had an interesting problem in the BSG recently concerning editing of a paper that had been submitted to the Occasional Papers of the BSG. The question that arose concerned the grounds for rejection of a paper. We had a manuscript submitted that received four reviews that recommended against publication, And that after the paper had already been rejected by a different creationists journal. Sounds simple, right? If the reviewers say reject, then we should reject. What's the problem? Increased mutation rates don't reduce fitness? I'm back! I was recently challenged that I couldn't go a week without checking my blog stats. I scoffed at this notion of blogaholism, so I negotiated the time down to two days, and voila! Two days of blog-free existence. Even weirder? I didn't think about it that much. So I'm back on this Monday morning (hey, it's still morning for another 23 minutes where I am) with a truly fascinating article from Genetics. There's so much that could be said about this research, but I'm going to just copy the abstract below. Check it out for yourself. Springman et al. 2009. Evolution at a High Imposed Mutation Rate: Adaptation Obscures the Load in Phage T7. Genetics doi:10.1534/genetics.109.108803. Sounds like an interesting meeting (although I don't think the reporter really understood the whale and turtle research). The latest Acts & Facts arrived in my mailbox today, sans the advertisement inviting me to order Andrew Snelling's monumental, two-volume Earth's Catastrophic Past. It does indicate that the book will be available around Thanksgiving, but the order page on B&N is now gone. And you still can't pre-order it at ICR. Seriously, how hard is it to take pre-orders on what will likely be the most significant work on creationist geology in decades? There's an interesting article on Science Daily on the Faulkland Islands wolf. I didn't even know there was a Faulkland Islands wolf. Ever since I affirmed that the evidence for evolution is reasonable and that evolutionary theory has not failed, I've been explaining ideas about science and evidence leading up to this post. After many years in this debate, I've come to the uncomfortable conclusion that we creationists have made an idol of our own arguments. I don't say this lightly or flippantly either. This is a deadly serious problem, and the conservative wing of Christianity desperately needs to address it. Shortly after I started grad school, the first bacterial genome sequences were published. In those days, genome sequencing resources were devoted to getting a broad sample of different bacteria and archaea. It was some time before different strains of the same bacterial species would be completely sequenced. When that finally happened, we were surprised to find that bacterial strains could have very different genomes, sometimes with thousands of different genes. In genomes that have only 2000-5000 genes to begin with, strains could differ by 20%. Along with other studies, this genome sequencing revealed just how much gene transfer goes on among bacteria and archaea. In a new paper in Virology Journal, Ogata et al. describe the PolB gene of a marine giant virus (AKA "girus") that infects a dinoflagellate. Dinoflagellates can poison fish and other marine critters when they bloom, but the dinoflagellate Heterocapsa circularisquama can be killed by Heterocapsa circularisquama DNA virus (HcDNAV). HcDNAV is a "giant virus" because it's giant, around 200 nm with a 356,000 nucleotide genome. Compared to the usual viruses that we're familiar with, that's quite big, actually approaching the size of the smallest bacteria.